Huawei’s business performance in recent years has been impressive, based on sticking closely to what its customers wanted and making the results easy to buy. But fierce price competition will challenge near-term profit ambitions, and Huawei’s 5G vision is ahead of the market. So could things be about to change? Huawei’s H1 2015 results caused something of a stir, as they seemed to promise a new cycle of rapid growth at the No.2 infrastructure vendor. The headline figure was that revenue for H1 was up 30% year-on-year, somewhat surprising as LTE infrastructure spending was thought to have passed the peak in much of the world. In context, Huawei’s revenue has grown at a 16% CAGR since 2010, while its operating profits have grown at 2%, implying very significant erosion of margins as the infrastructure business commoditises. Operating margins were in the region of 17-18% in 2010, before falling to 10-12% in 2012-2014. Our estimate, in Figure 1, uses the averages for the last 4 years to show two estimates for the full-year numbers. If the first, ‘2015E’, is delivered, this would take Huawei’s profitability back to the levels of 2010 and nearly double its operating profit. The second estimate ‘Alternate 2015E’, assumes a similar performance to last year’s, in which the second half of the year disappoints in terms of profitability. In this case, full-year margin would be closer to 12% rather than 18% and all the growth would be coming from volume. The H1 announcement promises margins for 2015 of 18%, which would therefore mean a very successful year indeed if they were delivered in H2. For the last few years, Huawei’s H2 revenue has been rather higher than H1, on average by about 10% for 2011-2014. You might expect this in a growing business, but profitability is much more erratic. For reference, Figure 2 shows that the relationship between H1 and H2 profitability has varied significantly from year to year. 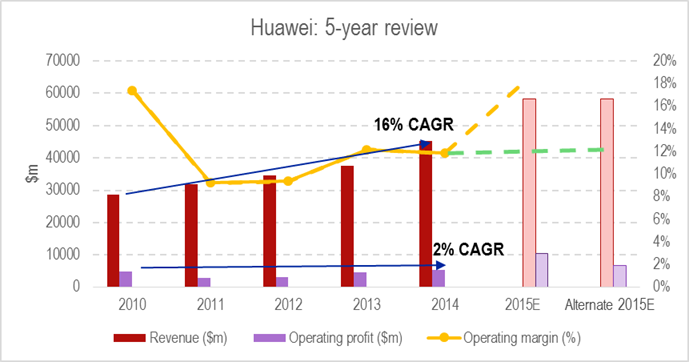 While in 2012 and 2013 Huawei’s operating profits in H2 were higher than in H1, in 2011 and 2014, its H2 operating profits were much less than in H1. 2015E shows the scenario needed to deliver the 18% annual margin target; Alternate 2015E shows a scenario where H2 is relatively weak, in line with last year. Huawei’s annual report hints at some reasons for the weak H2 2014, notably poor sales in North America, stockbuilding ahead of major Chinese investment (inventory rose sharply through 2014), and the launch of the Honor low-cost device brand. However, although North American wireless investment was in fact low at the time, it’s never been a core market for Huawei, and Chinese carriers were spending heavily. It is plausible that adding a lot of very cheap devices would weigh on the company’s profitability. As we will see, though, there are reasons to think Huawei might not have got full value from strong carrier spending in this timeframe. In any event, to hit Huawei’s ambitious 2015 target, it will need a great H2 2015 to follow from its strong H1. It hasn’t performed this particular ‘double’ for the last four years, so it will certainly be an achievement to do it in 2015. And if it does, how is the market looking for 2016 and beyond? Where are we in the infrastructure cycle? As Huawei is still primarily an infrastructure vendor, its business is closely coupled to operators’ CAPEX plans. In theory, these plans are meant to be cyclical, driven by the ever present urge to upgrade technology and build out networks. The theory goes that on one hand, technology drivers (new standards, higher-quality displays and camera sensors) and user behaviour (the secular growth in data traffic) drive operators to invest. On the other, financial imperatives (to derive as much margin from depreciating assets as possible) encourage operators to resist spending and sweat the assets. Sometimes, the technology drivers get the upper hand; sometimes, the financial constraints. Therefore, the operator tends to “flip” between a high-investment and a low-investment state. Because operators compete, this behaviour may become synchronised within markets, causing large geographies to exhibit an infrastructure spending cycle. In practice, there are other drivers that mitigate against the cyclical forces. 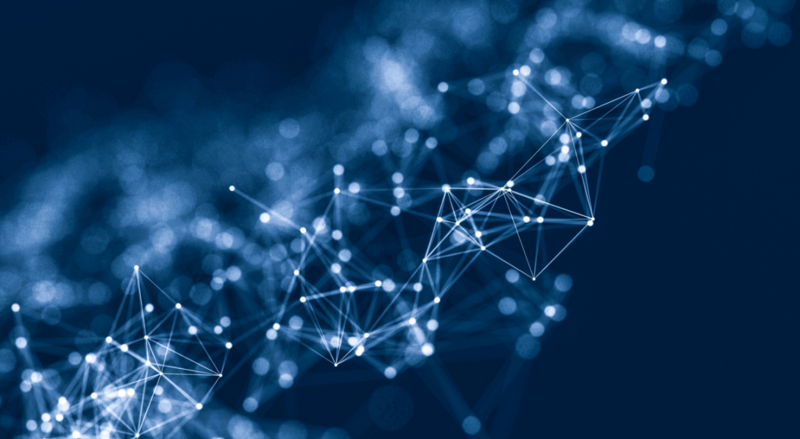 There are ‘bottlenecks’ in integration and in scaling resources up and down, and generally, businesses prefer to keep expenditures as flat as possible to reduce variations and resulting ‘surprises’ for their shareholders. In general though, there is some ongoing variation in levels of capex investment in every market, as we examine in the following sections. In North America, the tipping-point from sweating the assets to investment seems to have been reached roughly in 2011-2012, when the major carriers began a cycle of heavy investment in LTE infrastructure. This investment peaked in 2014. 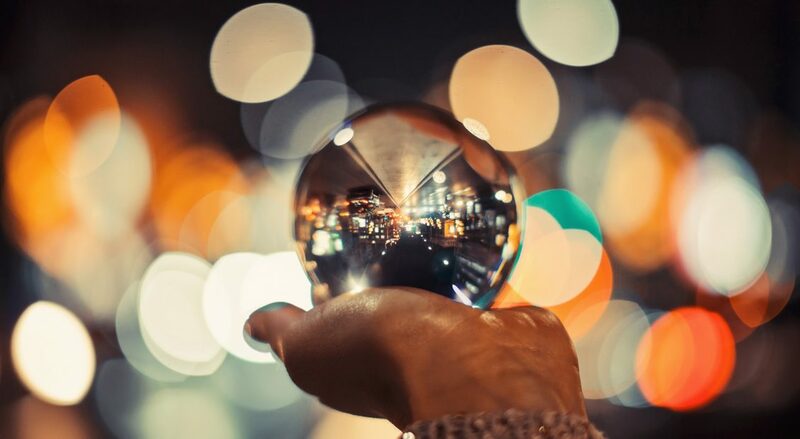 Recently, AT&T informed its shareholders to expect significantly lower CAPEX over the next few years, and in fact the actual numbers so far this year are substantially lower than the guidance of around 14-15% of revenue. Excluding the Mexican acquisitions, CAPEX/Revenue has been running around 13% since Q3 2014. From Q2 2013 to the end of Q2 2014, AT&T spent on average $5.7bn a quarter with the vendors. Since then, the average is $4.4bn, so AT&T has reduced its quarterly CAPEX by 21%. Figure 3 – AT&T’s LTE investment cycle looks over. During 2013, AT&T, Sprint, and VZW were all in a higher spending phase, as Figure 3 shows. Since then, AT&T and Sprint have backed off considerably. However, despite its problems, Sprint does seem to be starting another round of investment, and VZW has started to invest again, while T-Mobile is rising gradually. We can therefore say that the investment pause in North America is overhyped, but does exist – compare the first half of 2013, when AT&T, Sprint, and T-Mobile were all near the top of the cycle while VZW was dead on the average. Figure 4 – The investment cycle in North America. The pattern is somewhat clearer in terms of CAPEX as a percentage of revenue, shown in Figure 5. In late 2012 and most of 2013, AT&T, Sprint, and T-Mobile were all near the top of their historic ranges for CAPEX as a percentage of their revenue. Now, only Sprint is really pushing hard. If there is cyclicality it is most visible here in Sprint’s numbers, and the cycle is actually pretty short – the peak-to-trough time seems to be about a year, so the whole cycle takes about two years to run. That suggests that if there is a more general cyclical uptick, it should be around H1 2016, and the one after that nicely on time for early 5G implementations in 2018. Europe: are we seeing a return to growth? 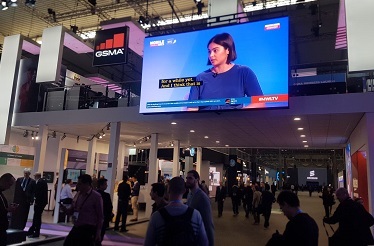 What do operators want from 5G? Figure 4: AT&T’s LTE investment cycle looks over. Figure 5: The investment cycle in North America.